Exciting new associate partnerships to coincide with the new season Turner Sims is pleased to announce three new partnerships: viola player Lawrence Power becomes an Associate Artist, SÓN (Southampton’s professional orchestra) is welcomed as Orchestra in Association; and Edition Records, who celebrate their tenth anniversary in 2018, become Turner Sims’ first Associate Label. In a wide-ranging Classical Season, Orchestra in Association SÓN, alongside Associate Artist Lawrence Power, explore The Lark Ascending by Vaughan Williams, the first in a three-part series focussing on the composer on the 60th anniversary of this death. The Vaughan Williams series also includes an afternoon centring on the composer’s early masterpiece On Wenlock Edge, featuring David Owen Norris, tenor Ben Johnson and biographer and Housman expert Peter Parker. Two rising stars make their Turner Sims debut: award-winning classical guitarist Laura Snowdon and classical saxophonist and 2016 BBC Young Musician of the Year finalist Jess Gillam, fresh from her appearance at the BBC’s Last Night at the Proms. 17th century Venice is brought to life through music with The English Cornett & Sackbut Ensemble. The programme features music by Claudio Monteverdi, Andrea and Giovanni Gabrieli, Alessandro Grandi and Claudio Merulo, and also includes the two winning pieces from the 2018 NCEM Young Composers Award. Associate Artist Lawrence Power is joined by two distinguished colleagues, cellist Natalie Clein and pianist Simon Crawford-Phillips, for a special evening of chamber music. One of the UK’s leading chamber groups, the Maggini Quartet, visit as part of their 30th anniversary celebrations. Resident ensemble at Turner Sims in the 1980s the Quartet’s performance also marks the passing in January 2018 of Professor Peter Evans, Professor of Music at the University of Southampton from 1961-1990, and the driving force behind the construction of the concert hall. UK, European and international jazz, will celebrate everything from the partnership between Billie Holiday and Buck Clayton, to the zen-funk of Swiss master Nik Bärtsch and his group Ronin. Fellow ECM recording artist Julia Hülsmann brings her trio to Turner Sims for an exclusive UK concert, whilst Mexican pianist Alex Mercado makes his first ever UK performance as part of University of Southampton’s Mexico Week, showcasing music from his recent album Paisajes. Mercury-nominated Laura Jurd’s Dinosaur, play music from their new album Wonder Trail, as the first of two Associate Label events with Edition Records. The second features an exclusive double bill of saxophonist Tom Barford and guitarist Rob Luft, both winners of the prestigious Kenny Wheeler Award. Three Scandinavian nights feature as part of the jazz series: Danish bandleader Kathrine Windfeld, one of Europe’s rising stars, visits with her big band; Tord Gustavsen and his trio present their full-sounding ‘Nordic Blues’; and the combined talents of Bugge Wesseltoft, Magnus Öström and Dan Berglund unite as the new supergroup Rymden. Renowned vocalist and broadcaster China Moses performs high-voltage jazz, soul and blues. A special world music series focusses on artists responding to challenging surroundings through music. Damascus born Maya Youssef is a virtuoso performer of the qanun, the traditional Syrian 78-stringed plucked zither. Youssef uses music as a healer and antidote to what is happening not only in Syria, but the whole world. Algerian band Tamikrest blend the musical influences of Africa, the Maghreb and the West. The Malian desert has been fought over, conquered and re-conquered, it remains a symbol of Tuareg defiance and hope, the spiritual home of dispossessed people. Kidal is the town in which Tamikrest first came together as a group, and on Tamikrest’s fourth studio album titled Kidal, the band pays homage to it. In her Royal Geographical Society lecture entitled Human Impact on a Remote Region: Reflections from the Amazon, adventurer Pip Stewart questions whether so-called human development actually hinders the progression of humanity, is it time we re-evaluate the choices we make, which have such a huge impact on the world? Elsewhere 2017 Scots Trad Music Awards ‘Folk Band of the Year’ Breabach bring their unique musicianship to Turner Sims for the first time, combining twin bagpipes, fiddle, mandolin, bass and guitar with Gaelic vocals. Grammy award winning singer, dancer and percussionist Dobet Gnahoré returns with music from her new album MIZIKI, whilst Irish folk legends Altan transport audiences to rural Donegal, present music from their new album The Gap of Dreams. Christmas at Turner Sims is not to be missed. To conclude the Vaughan Williams series, David Owen Norris hosts a celebration of The Oxford Book of Carols, which the composer co-edited, on its 90th anniversary. Cara Dillon returns to Turner Sims with Upon a Winter’s Night, and is joined by her wonderful band who weave Celtic and folksy rhythms alongside reverent and atmospheric carols. And rounding off the Christmas events is a jazz-filled interactive concert for all the family; Jingle Bell Jazz promises all your favourite Christmas melodies. 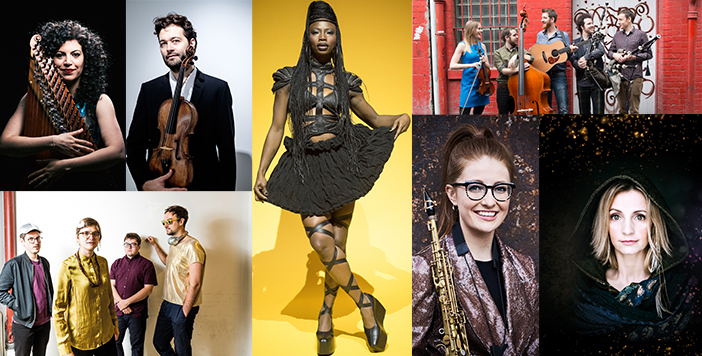 The launch of a new season is always an exciting moment, and we are proud to present a line-up of exceptional musicians from around the globe. Autumn 2018 is made even more special for us as we announce a new roster of Associate Artists and partners, enabling us to bring inspiring musical encounters to audiences in Southampton.